Some months ago The Daily Telegraph reported that Frances Osborne, author of the acclaimed The Bolter, was soon to publish an ‘Upstairs Downstairs-style romp’. Osborne’s own site also quotes The Guardian’s prediction that Park Lane, the aforementioned ‘romp’, would in fact be at the vanguard of a whole new genre of books – one appealing to fans of Downton Abbey. Comparisons with Downton Abbey or Upstairs Downstairs will certainly do book sales no harm, yet the great house as subject – both its upstairs and downstairs – is a grand British literary tradition that far predates television’s love affair with Dame Maggie Smith. The path from Pemberley to Brideshead is easy to trace and more recently there have been excellent modern examples, from Alan Hollinghurst’s The Stranger’s Child (2011) to Sarah Waters’ The Little Stranger (2009), back through Atonement (2001) and The Remains of the Day (1989). This old genre is alive and well, allowing as it does, the author to explore in microcosm an ever-shifting British identity across the class divide. 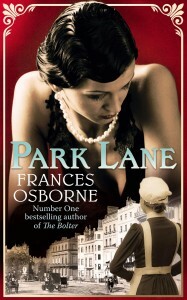 Park Lane is a well-researched, convincing addition. Osborne’s narrative, which spans the period 1914 to 1923, focuses tightly on two women – Grace and Beatrice – whose lives become intertwined when Grace unwillingly takes a position as a maid in Bea’s familial home. Grace has not wanted to enter service but has found her options limited by snobbery about her Carlisle accent. The Masters family she has come to work for are undeniably self-made, with not a whiff of aristocracy or old money about them, but their Park Lane, London home serves to confer standing and the appearance of permanency upon them. The novel’s time frame means that the historical backdrop is the struggle for women’s emancipation, the creeping shock of a world at war and the consequent changes to society that occur in its wake – indeed the last section of the book is called Aftermath and refers to both the personal and national fall out of the tragedy of war. We are ushered into the world of Park Lane as Grace attempts to enter Bea’s room without disturbing her sleep. She creeps as quietly as she can but is eventually betrayed by a creaking door. In the awkward scene that follows, and indeed in the rest of the novel, there are three main characters – Bea, Grace and the house that won’t stay quiet. In an inverse of this first scene, Bea later breaks taboos by deliberately walking quietly around the house like a servant in an ‘Oh-so-silent rebellion against convention’. Bea and Grace are not to know at this stage how their lives will develop and intertwine but both struggle to find her own way to manage the house. Eventually Bea notices a large crack appearing, one that looks as if it could shake the foundations and bring the whole house down and this portent of doom cannot be shaken off lightly either by her or the reader. As Bea becomes increasingly involved with Mrs Pankhurst and the cause, her rebellions become ever noisier and her world outside of Park Lane expands, but the house with all its creaks and cracks makes its presence felt throughout and always calls her back. Grace on the other hand is to be a fleeting presence, albeit one that leaves a lasting imprint. With Osborne we are in safe hands. Grace and Bea could both so easily fall into cliché but are instead alive, dancing to the music of their time. The only drawback of this close and convincing portrayal is that some of the other characters are not so well drawn. With the exception of Bea’s mother, who looms largely and impressively over everything, other minor characters can seem a little flimsy. In particular, apart from the two brothers, male characters appear almost as extras, dropped in to the narrative to bring romance, trouble, or both and neither of the women’s fathers gets more than a cursory mention. Whilst we can rest assured that the truly grand houses, the Downtons and Pemberleys, are made of such stern stuff that they have weathered – and will continue to weather – centuries of storms, the newer Park Lane mansion is eventually demolished and rebuilt as a hotel. In a nice mirroring of the way that the Masters family made their money, progress flattens all in its wake. At the end Bea watches as a demolition ball smashes into the building, breaking it open so that ‘the house’s secrets were suddenly opened up to the world outside.’ In fact it is novels like those mentioned above and Park Lane that have done this – giving us an insight into a world of privilege we wouldn’t otherwise have seen and thereby demystifying it.